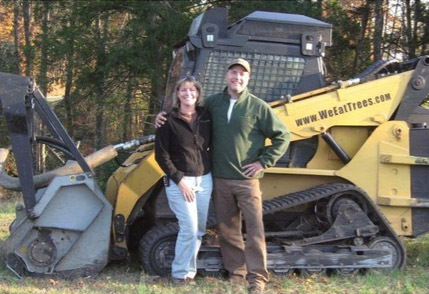 The Franklin Prime Mover is a high horsepower tree shredder designed from the ground up to provide maximum production with a much lighter footprint than most rivals. 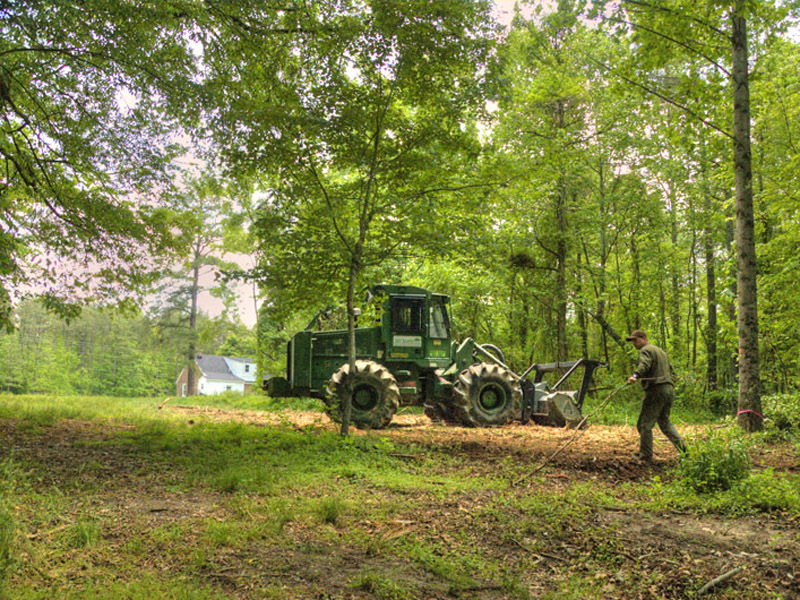 This purpose-built machine is capable of maneuvering in tight spaces and still handling larger storm damaged trees as well as grinding cut-over following a timber harvesting operation. With a near perfect blend of horsepower to weight, "Frankenstein" as we call it is the only machine of its kind in operation in central Virginia. 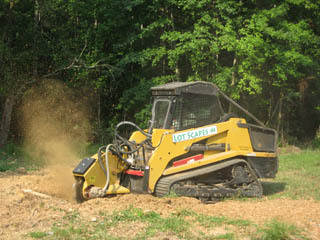 This compact unit is ideal for cutting trails and plantation cutting in tight spaces. We have added custom planer knife teeth for increased production and a better finish. 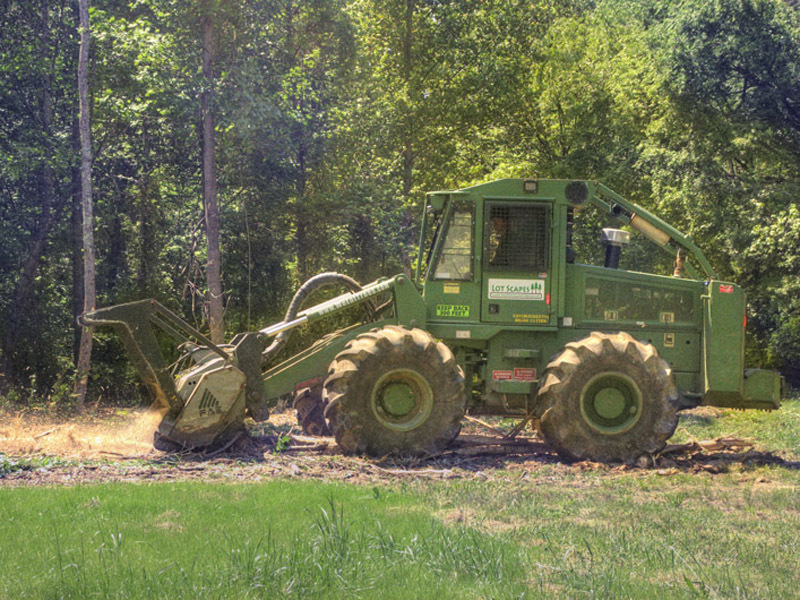 This 500 hp unit is the most powerful tree shredder ever produced. 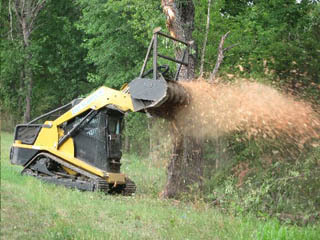 Ideally suited for clean up of large trees and stumps from cut-over timber or storm damage in virtually any application. 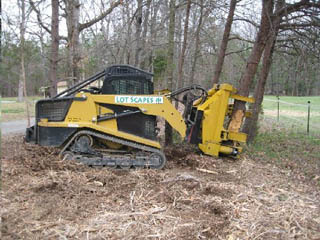 Custom built by Lot Scapes this equipment is ideally suited for small tract timber harvesting or thinning operations. This apparatus handles trees with a diameter of up to 17". This device enables the fast collection, relocation or loading of unwanted debris or scrap material. 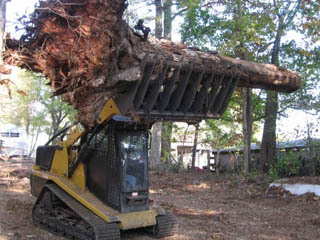 Capable of lifting whole tree sections and root balls, it is much safer and more efficient than hand work. The operator is well protected within the cab of the machine behind a "Bullet Proof" lexan door. 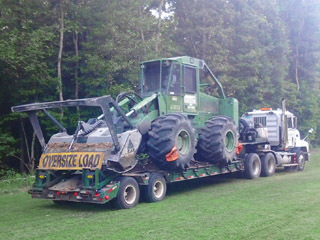 Custom made to Lot Scapes specifications, this unit is the most powerful rubber-tracked shredder ever produced. Capable of handling much larger material than the RC 100 and still easy on sod, grass or pavement. Custom Fabricated by Lot Scapes this specialized apparatus is capable of cutting on hillsides and in ravines unreachable by conventional equipment. 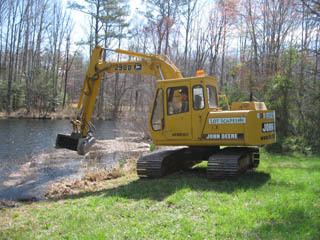 Also excellent for trimming overgrown driveways and around creeks and ponds. 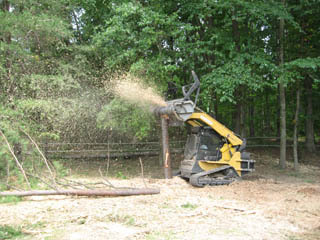 This custom built apparatus is capable of grinding stumps of virtually any size or height to a depth of about 24". 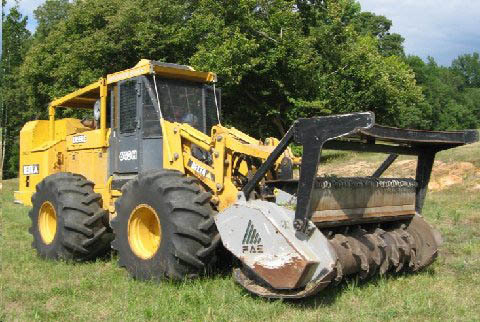 Ideally suited for large areas with numerous large stumps.